The first batch of farm blueberry jam is finally done. All the jars gave out resounding pops as they sealed, and now simply await a lovely piece of toast. I used the recipe on the back of the box of pectin, but I'm hoping my next round will use this tasty concoction from Food in Jars. It sounds utterly magnificent, and I'd have a use for the lavender in the garden. I'm also wondering if I could use yuzu in place of lemon to round out the local flavor. Wash and destem the blueberries, and then crush them one cup at a time. Stir in the pectin packet while bringing the mixture to a good rolling boil. (A rolling boil is one that doesn't let up even when being stirred. Mind you, the stirrer gets a periodic painful splash.) Once the rolling boil is going stir in all of the sugar all at once, and keep stirring. Boil and stir like this for one minute. Remove from heat, and dole into jars. Since I don't have a water bath canner here, I just use a big pot. Fill a pan with water and place the jars (also filled with water) inside, and bring them to a good boil to sterilize. I leave them on a low hum while processing the fruit, which makes me feel like they're super sterile. Sterilize the lids (or rings and lids) by placing them in a rather large bowl, and pour a kettle of boiling water iover them lids until they are well submerged. Leave them there until you need them. A basic rule is to fill jars to about an inch (two centimeters) of the top. Once the jars are filled, wipe the lip and mouth to make sure there's no jam in the way of a good seal. Carefully fish the hot lid out of the bowl, screw it on, and gently plunk the jar back in the water bath canner/pot. Repeat until all the jars are full or the canner is full of jars, whichever comes first. Put the lid back on the pot/canner and bring it back up to a good boil. Once it's boiling, let the jars process for a good ten minutes. Then, turn off the heat, and remove the jars. Place them on a flat surface to cool. As they cool that tell-tale pop signifies that they have sealed. The jars should hang out there for roughly 24 hours to settle, and then store them in a relatively cool, dark place. They should keep on the shelf for about a year. A potato masher is the perfect crusher, but I just used a fork since I don't have one. A food processor might also work, but don't puree the berries. 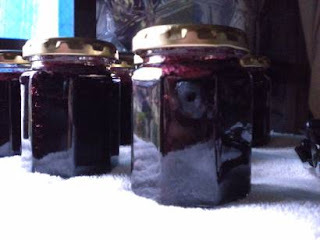 Jams are chunky by nature, and a puree is a different consistency and might change the canning time. I look for jars that both fit in the canner/pot and have lids with that little raised bit in the center that will depress when sealed. The best I've found that don't cost upwards of 500yen each (I'm not kidding.) are at Tokyo Hands in Shinjuku for just under 100yen. They also sell replacement lids, so I can reuse the jars. That said, I'm giving serious thought to getting a canner over here some way or another along with jars. If you've read this far and are interested, let me know. We'll get canning!